Christian Mayes and Sarah Landrum met through mutual friends who were trying to set up Christian. It took a while for the two of them to warm up to one another, but finally, on a rainy Sunday, Christian invited Sarah to lunch by saying, "I gotta eat, you gotta eat, so we might as well do it together." From that moment on, Sarah says she knew that he was different. On their 9-month anniversary, Christian proposed on an after-dinner walk by the river. He said, reminiscent of their beginnings as a couple, "I've got to get married, and you've got to get married, so you might as well marry me." Sarah wasn't sure about her husband-to-be's idea of a brunch wedding. As it turned out, a brunch wedding was just to this couple's taste. This way they could wake up in the morning and immediately begin the preparations and enjoy the festivities. There was no waiting around, as the ceremony started at 11:00 A.M, and, with a November wedding, they were able to enjoy the warmest part of the day with their guests. Besides the early ceremony and reception, the day was highlighted with a traditional, classic reception. But, like with the brunch-aspect, Sarah and William wanted to add themselves into the event. One thing that they both find important is the legacy of love and support that they both come from. They celebrated their families by having a "family themed" wedding. There was a wedding dance for all married couples; each couple was slowly dismissed based on how long they'd been married. Sarah's and William's grandparents were the last two couples dancing. Their wedding was a beautiful autumnal affair, with soft golds, browns, and creams, with the occasional pop of maroon and green. This celebration of their love and appreciation for their family was the perfect way to honor their own love and new beginning as husband and wife. Make sure to see more of the Mayes Wedding on page 36 of bridebook! Crystal and Vance first met in a dorm elevator at college. While Crystal didn't think much of it at the time, they later bumped into each other again at a party and sparks flew. When Crystal came home from work one late January evening, she found a picture frame on every third step of her staircase. Each frame contained a different photo of Crystal and Vance in chronological order from when they first met to a recent shot. When she reached the top of her winding stairs, she found Vance on one knee with the engagement ring in hand. All the while, one of her closest friends caught the entire thing on the phone as Crystal had forgotten to hang up with her when she walked in to find such a surprise! 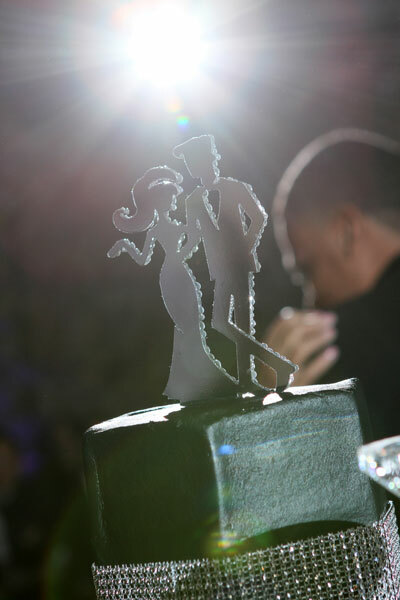 Crystal's modern "chic-bling" theme contained beautiful crystallized embellishments, from her shoes to the cake. Their wedding had a few unique touches, such as the seating for the ceremony where their loved ones surrounded them during their vows; family style reception tables; and an all-black wedding cake and programs. They used their engagement photo album as their guest book and the Koonce couple sat on a couch instead of the typical sweetheart table used at receptions. Despite the headache that comes with any wedding planning, when Crystal heard Vance's impromptu speech, she knew it was all worth it. The newlyweds took their honeymoon to Cairns, Australia and Savusavu, Fiji. Be sure to see the Koonce wedding on page 112 of the second issue of bridebook, on newsstands now!